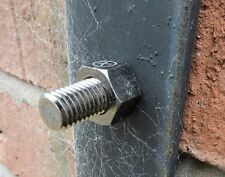 Magnetic Fake Bolt Cache. These are the next generation ones which are not Bright Silver or fake rust colour, but what a real nut and bolt looks like in real conditions. The Next generation. Now the important bit.the log is made from "RITE IN THE RAIN" waterproof paper and will be installed and ready to go, when your receive it/them. Die "Smart Geocache - WiFi Laser Station" funktioniert sehr einfach, gibt deinem Geocache aber einen ganz moderenen Kick Smart Geocache - WiFi Laser Station. (Es ist kein Internet notwendig!). Der Laser dient als Geocache Station, und zeigt dem Geocacher dann den Weg zur nächsten Station oder zum Final. Sie eignet sich gut um Zwischenstationen oder den Final darin unter zu bringen. Ist allerdings nicht wasserdicht, dazu solltest Du noch wasserdichte Tüten oder unsere Boxen verwenden. Die grüne Farbe passt klasse zum Wald und wird so leicht nicht gefunden. DA wird der ein oder andere Geocacher sicher ein paar Minuten längern suchen müssen. Der Deckel kann einfach zur Seite weg gedreht werden, um so an den Petling zu gelangen. - inklusive Petling und Logstreigen. Inklusive Dose und Logbuch. Da wird der ein oder andere Geocacher sicher ein paar Minuten längern suchen müssen. Der Deckel kann einfach zur Seite weg gedreht werden, um so an die Dose zu gelangen. In der Kiste befinden sich zudem u.a. ein Travel Bug und ein FTF Mirco Geocoin. Mit diesem tollen Start-Set erhalten sie alles, um einen Geocache verstecken zu können. Munitions-Kiste mit schwarzem Deckel und Dichtung. Das komplett fertige PETling-Set mit dem Logbuch 160 (für 160 Logeinträge) und einem passenden Mini-Bleistift zum Loggen. Es liegt auch schon das Logbuch mit Bleistift dabei. In der Dose befinden sich zudem u.a. ein Travel Bug und ein FTF Mirco Geocoin. Mit diesem tollen Start-Set erhalten sie alles, um einen Geocache verstecken zu können. 10 x das komplett fertige XXL-PETling-Set mit dem Logbuch 1.500 (für 1.500 Logeinträge) und einem passenden Bleistift zum Loggen. Einwandfreie, neu produzierte Filmdosen komplett mit Deckel. Sie sind 3,2 x 4,8 cm groß und in verschiedenen Farben erhältlich. Wasserdichte Dose (ca. 21 cm x 14 cm x 7 cm). ein Bleistift. Die Dose bietet ausreichend Platz für TBs oder Coins. Used, clean 35mm film canisters (Fuji, Kodak, Ilford.) with lids(Boites à pellicule, Filmdose), great for - small collectibles. - storing coins (monnaie / kleingeld / change). - brown with brown lid: 4. Wasserdichte Dose (ca. 15 cm x 10 cm x 5 cm). ein Bleistift. Die Dose bietet ausreichend Platz für TBs oder Coins. 4 each Bison Tubes: 4 different colors: Black, Blue, Green, Red. 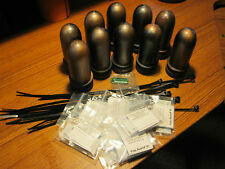 Each Bison Tube tube has o-ring and lid. The inner tube with lid is not included. The red tube has rust on the key ring. 3 each 35mm Film Canisters: Used, empty, wrapped in camouflage tape. You are buying 6 Small Magnetic Colorful GeoCaching Containers. One of each color = (1 black, 1 green, 1 red, 1 blue, 1 gold, 1 silver). The strong Neodymium magnet is located on the inside flat bottom. Two magnetic bolt geocache containers. With built in magnets and O-rings. Including free rite in the rain logs. With FREE rite in the rain logs. 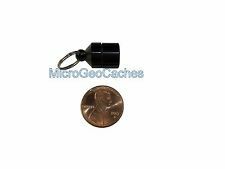 You are buying 12 Small GeoCache Containers. 12 - Regular Size Black Bison Tube. 1/2" x 1-7/8" (12 x 48mm). Made of High-Grade Aluminum. They are all waterproof with a rubber O-ring. The screw-top has a split-ring so you have hiding options. "The Sneaky Bottle Cap" micro caches with logs. Just make a small hole with a screwdriver or stick and place the plastic container in the hole so that the bottle cap looks to be just laying on the ground. A very sneaky Realistic Grass tuft cache with room for Travel Bug,Geocoins and swag. Included are FIFTY micro plastic pipette style geocache containers! (Picture shows 10, but 50 are included in this lot!). They have a snap tight lid. New and unused. You are buying 50 GeoCaching Containers. 50 - Large Size Camo Bison Tubes. Made of High-Grade Aluminum. They are waterproof with a rubber O-ring. Up for your consideration is for another one of my handmade unique caches, "The Sneaky Loose Change" micro caches with logs. Just make a small hole with a screwdriver or stick and place the plastic container in the hole so that the coin looks to be just laying on the ground. CONNECT YOUR GEOMATE. JR TO YOUR COMPUTER VIA THE USB CABLE. USB CABLE ONLY (GEOMATE. JR REQUIRED). JR UPDATE KIT. NEW AND SEALED. You are buying 50 Small GeoCaching Containers. Made of High-Grade Aluminum. They are all waterproof with a rubber O-ring. From toy to cache. This is a new, custom made fun/unique geocache container. It is of a Plastic Furby Toy with a 1.5 ml flip top plastic container. Perfect for anyone interested in unique hides and favorite points. U pfor your consideration is another one of my handmade unique caches, "The Sneaky Sprinkler Head" micro cache with logs. 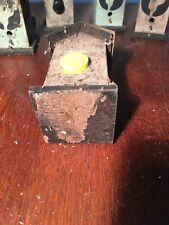 Just make a small hole and place the sprinkler head container in it so it appears to be a real. This is a super evil cache made from a real acorn! The cap unscrews to reveal the Log sheet that is printed on Rite in the Rain paper. Acorns will vary in different sizes which will make the size of the log sheet also vary (between. 50" to. 85"). Das komplett fertige PETling-Set mit dem Logbuch 180 (für 180 Logeinträge) und einem passenden Mini-Bleistift zum Loggen. I am a geocaching instructor and a regular contributor to FTF Magazine. My geocaching handle is BaytownBert. The tube is basically as water-proof as a soda tube. These are much heavier duty and virtually unbreakable. Die Ratten der Lüfte: Die Taube ist aus stabilem Kunststoff und hat einen Clip zum befestigen. Auf dem Rücken befindet sich ein Nano. Wasserdichte Dose (ca. 12 cm x 8 cm x 4 cm). ein Bleistift. Die Dose bietet ausreichend Platz für TBs oder Coins. Sieht aus wie eine Batterie, ist aber keine. Gewicht und Material lassen eindeutig auf eine Batterie schließen. Up for your consideration is a collection of my handmade unique caches, "The Sneaky Starter Kit" micro caches with logs. The kit includes The Sneaky Loose Change caches, the Sneaky Bottle Cap caches, the Sneaky Golf Ball caches, and the Sneaky Rock cache. Wasserdichte Dose (ca. 8,5 cm x 8,5 cm). ein Bleistift. Die Dose bietet ausreichend Platz für TBs oder Coins. Die Logbücher passen ideal in einen 12 cm langen PETling (Maße: 7,5 cm x 1,5 cm x 0,6 cm). So no more, maintenance logs stating the log is a mush. Also included is 2 Spare logs (Per Bolt). Magnetic Fake Bolt Cache. These are next generation Bolts which are not Bright Silver or fake rust colour, but what a real nut and bolt looks like in real conditions. 5 Empty plastic 1 oz Containers Diabetic Strip Geocache Containers Free Ship!! Paintball Tube Cache Containers, Geocache Container, With Log! Lots of Room!